Do you need a security gate installed or repaired at your Oklahoma City home or business? Tulsa Home Guard will travel to you and take care of it for you! Tulsa Home Guard has over 30 years experience installing and repairing security and barrier gates. We’ve worked with nearly every kind of gate you can imagine! We specialize in manufacturing custom built iron gates, and we have a large variety of styles, sizes and designs available. Your gate can run by hydraulic, solar, mechanical, or electromechanical power. We also have telephone entry systems, card and proximity readers, and keypads available for your access controls. Not sure what you need? Let one of our installation experts come to you and explain your options! 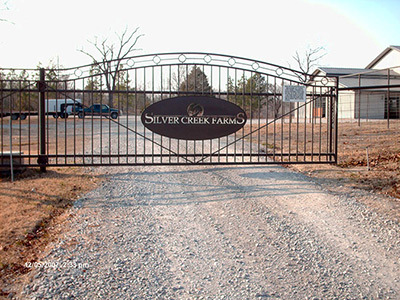 In addition to handling installations, we also repair gates and perform annual maintenance checks on gates throughout the Oklahoma City area. Some manufacturers recommend yearly service checks on their gates to maintain optimal performance, and we take time to throroughly inspect each component to make sure it is not slipping or deteriorating. We understand how important your security is to you. Whether your gate has an electrical issue, needs replacement parts, is ready for a service inspection, or has problems of any kind, Tulsa Home Guard has trained technicians ready to restore you to full security quickly and efficiently, every time! Tulsa Home Guard is experienced in working with all types of barrier and security gates and gate openers, and we would be honored to help you with your gate in the Oklahoma City area. Contact us today at 918-584-4923!